Teacher Tom: Vote For Me (With Volcano Painting)! Vote For Me (With Volcano Painting)! I've spent the last 24 hours trying to figure out how to do this, and I think my best bet is to show you pictures of a cool idea to try out with the children in your life as a backdrop to this post of shameless self-promotion. That way, even if you have no intention of voting for me, you'll still click away with something to show for the time you spent here. 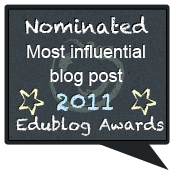 I'm absolutely stunned to find that I've made the nomination short list for three 2011 Edublog awards, and humbled in the knowledge that this recognition comes from fellow teachers and parents. Thank you. 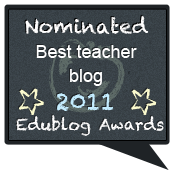 I've been nominated as "Teacher Tom" in the category of Best Teacher Blog . . .
. . . as "Thomas Hobson" in the category of Best Individual Blog . . .
. . . and as Thomas "Teacher Tom" Hobson in the category of Most Influential Blog Post. I think of the three nominations, I might be most proud of this one. The nominated post is entitled Spoiled Brats, which was written as a follow up to a previous post called The Language Of Command in which I discussed the bad habit many of us grown-ups have of bossing kids around. Since the post was first published in August, it has made the rounds, having been shared on Facebook over 2,800 times at last count, and to this day there are still readers dropping by to have a look at it. bowl of vinegar, creating a sort of super eruption. I would love your vote in one or all three of the categories. If you're so inclined, here's the link to the voting page. As you can see, however, despite their intense focus on "more vinegar,"
In fact, if you're really into it, you can vote once a day in each category between now and midnight on Tuesday, December 13. This is especially important information for those of you who can't decide for whom you'd like to vote. For instance, I'll likely have new "favorites" each day in several of the categories. about a half hour. Not bad! So please vote for me, vote soon, and vote often . . . but if not, at least enjoy some volcano painting! It is really inspiring to see teachers pursuing their passions. You remind us that inspiration is everywhere; we can receive it from many sources, as long as WE remain open to it. I love that you showcase the brilliance of children! Teacher Tom you can count on my vote daily. 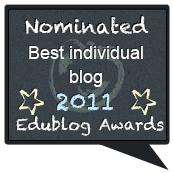 The more people who vote for you (and any other early years blog), then the more the profile of this education sector is raised within the wider education community. Also if lots of people vote, then the whole wide education world eventually are going to have to have a rethink about why people read and write blogs and their tremendous value to people who work with children. So please, even if you only have a couple of minutes this once, then stick in a vote. We'll all thank you. And give Tom a cheer too! Hooray! Appreciating this totally do-able way to support this awesome blog! Thank you. We've mixed colors with baking soda and vinegar, but never painted with it! How cool is that ;). As always, I'll be voting. You rock! Really cool stuff!!! Looks great. Yes!! You get my votes, Teacher Tom/Tom Hobson. Somehow I missed the spoiled brats post, so you'll be up to 2801 readers by the end of today. You're on my favorites list and I hope these awards help more people find you. Thank you so much for the great post on this article. "It's For You, Teacher Tom." "Maybe When You Grow Up!"